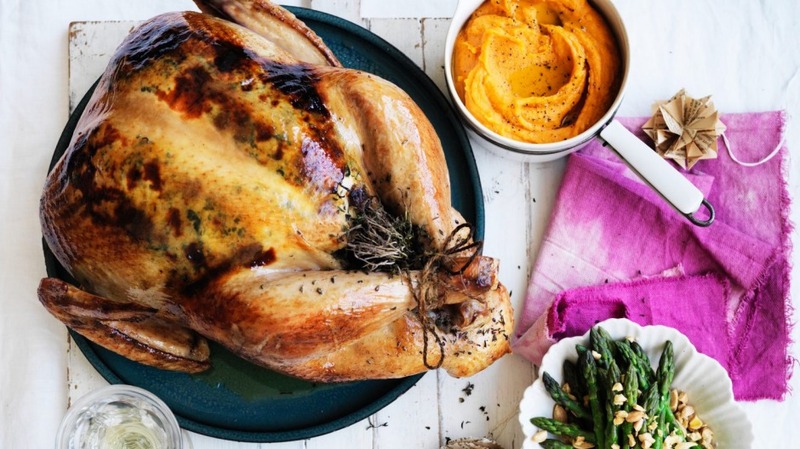 It's traditional, sure, but there's a simple reason why turkey with all the trimmings is such a hit at Christmas - it's so utterly delicious! To make stuffing, heat a little olive oil in a frying pan. Add onion and garlic and cook over a low heat for about 5 minutes or until onion is soft. Remove from heat and set aside to cool. Blanch spinach in boiling salted water until just wilted, then drain and rinse under cold water. Squeeze excess water from spinach. Chop coarsely. Combine onion mixture with spinach, breadcrumbs, herbs, raisins and butter in a medium bowl. Add eggs, season with salt and pepper and mix well. Rub skin with plenty of olive oil and season turkey inside and out. Reduce oven temperature to 50C, cover turkey with foil and allow it to rest in oven for about 20 minutes. Remove drumsticks, thighs and wings at second joint. Slice breasts into 1-2cm-thick slices, being careful not to rip skin. Serve on a platter with mustard fruits on the side. Don't forget all the trimmings: asparagus, almonds and burnt butter; sweet potato puree; and boiled corn with chilli butter.